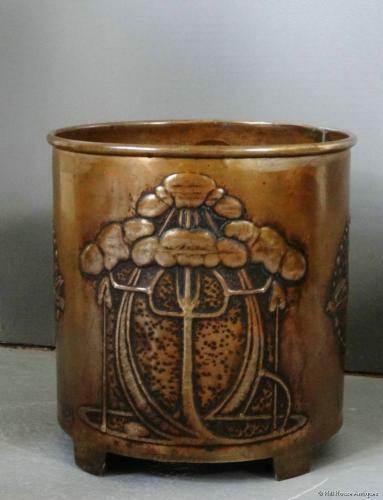 Glasgow Style Arts & Crafts very well patinated brass planter/jardiniere (with some age verdigris) on raised stile feet, by Marion Henderson Wilson (1869-1956); monogrammed MHW to front. Stylised repousse flying birds (reminiscent of Peter Wylie Davidson) and tree designs. Considered as one of the “Glasgow Girls”, Marion Henderson Wilson attended the Glasgow School of Art from about 1884 until 1896. Within that time she won two prizes in both national and local competitions and was also a regular exhibitor at the Glasgow Society Lady Artists’ Club. Her speciality was mainly in metalwork; repousse brass copper and tin, all very much in her own distinctive Glasgow Style.